“You look a little rigid today,” I said, looking across the table. “How are you, when you don’t listen?” I asked. “When I don’t listen, it’s because I am right,” Roland flatly stated. Roland stopped, shook his head. Deep breath. “Yes,” he slowly drawled. This entry was posted in Problem Solving Skills and tagged problem solving on May 16, 2018 by Tom Foster. What Changes About the Work? What will be the nature of work? As we adopt technology into the enterprise, what will change about the work? Those who sit in my workshops know that I define work as – decision making and problem solving? What will be the nature of decision making and problem solving as we embed technology into our internal production systems? Physical robotics are already creeping in to production work (S-I). Robots are most often adopted into physical work that is repetitive, requiring precision cuts, punctures, bends, dipping, pouring, lifting. Robots are also useful in production environments where human involvement is uncomfortable (cold, heat) or dangerous (hazardous exposure). As companies adopt robotics and other technology, what changes about production work? What decisions are left for humans? And, what of supervisory work (S-II)? Typical (S-II) tools are schedules and checklists, the role is accountable for making sure production gets done, on pace and at standard spec. If we can sense most critical items in a production environment, with precision, in real time, what decisions are left for humans? As companies adopt technology, what changes about supervisory and coordinating work? And, what of managerial work (S-III)? Typical (S-III) tools are work flow charts, time and motion, sequence and planning. The role is to create the system that houses the production environment. Most sub-enterprise software (as opposed to full enterprise software) is simply a transaction system that records transaction activity through a series of defined steps. Most computer software contains embedded rules that enforce a specific sequence of task activity. If most systems are designed around software systems, what decisions are left for humans? What changes about system work? With a concentration in Ops (COO), Finance (CFO), Technology (CTO), the essence of executive management is functional integration. Most enterprise (full enterprise) software is designed to integrate end to end functionality across the organization. It contains hooks that communicate from one function to the next, with a plethora of configurations possible depending on the desired integration. If functional integration is controlled by enterprise software, what decisions are left for humans? What changes about functional integration work? These are not idle questions. 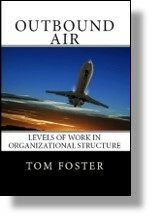 This entry was posted in Culture, Organization Structure, Systems and tagged decision making, levels of work, nature of work, problem solving, technology on May 9, 2018 by Tom Foster. I waited for Melissa to stop, to take a pause in her thinking. “I talked to one of your new teammates this morning and he said he might have a solution,” I said. This entry was posted in Problem Solving Skills and tagged newbie, problem solving on April 30, 2018 by Tom Foster. “Oh, yeah, and how am I supposed to do that?” Marjorie wanted to know. This entry was posted in Problem Solving Skills and tagged coaching, disagreements, problem solving on December 18, 2017 by Tom Foster.